Poe’s Note: In 1987, Los Angeles Mayor Tom Bradley declared April 28 Masters of the Universe Day. This was around the time the Power Tour came to LA so I’m sure this was some sort of publicity stunt, but fans, tongues firmly in cheek, have embraced the day as a time to celebrate their favorite musclebound heroes and villains. 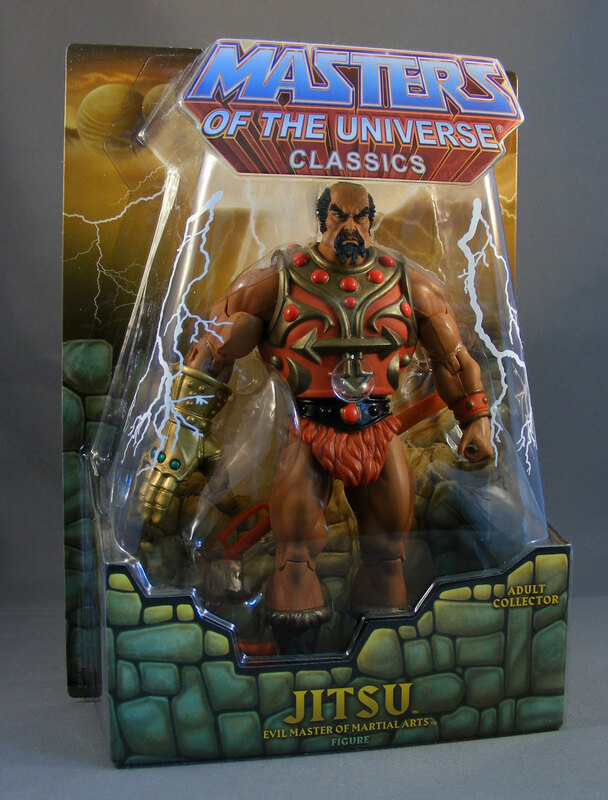 In honor of MOTU Day, I offer you JITSU! Jitsu’s an interesting fellow from my perspective. Despite being a major member of Skeletor’s Evil Warriors, I never owned this figure or even knew anyone who did. His appearances in MOTU-related media were sparse; he appeared in the Filmation episode “The Dragon Invasion” and a few sporadic storybook and comics, and that was all. Writer Larry DiTillio later claimed his absence in the cartoon series was due to fears he would be perceived as a racial stereotype. 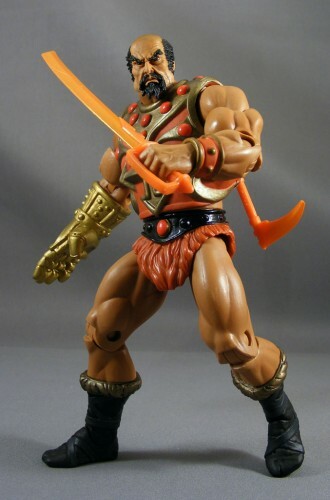 So the only two Asian characters in MOTU were villainous martial artists…at least there wasn’t a turban-wearing Middle Easterner among Skeletor’s regulars, right? 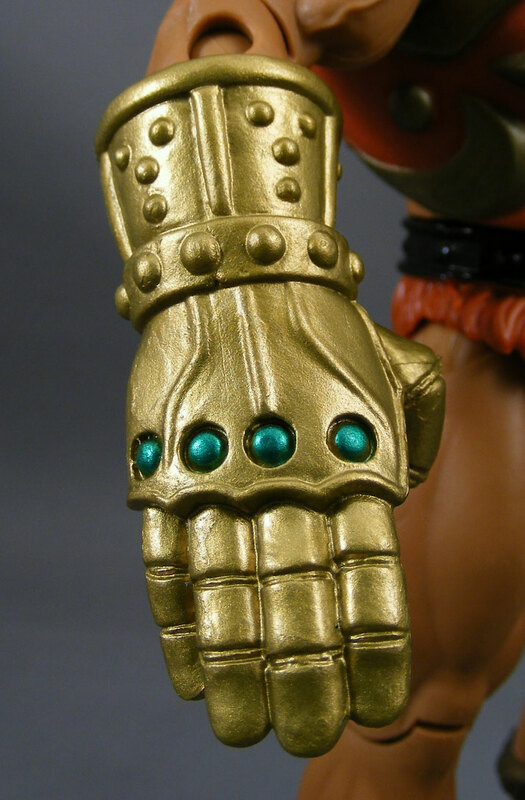 While the vintage Masters of the Universe line had a lot of He-Man and Skeletor variants that were counterparts to one another – Battle Armor He-Man and Skeletor, Thunder Punch He-Man and Dragon Blaster Skeletor, Flying Fists He-Man and Terror Claws Skeletor – but it was rare for any other characters to get a counterpart. And while it’s not exactly official, I’ve always thought of Jitsu as the evil counterpart to Fisto. The difference? Fisto punches, while Jitsu chops! Jitsu’s real name, Chopper, comes from the series bible, where it was his original name – only later did they change it to Jitsu. 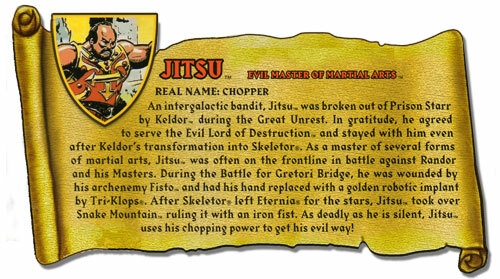 We’re told Jitsu is an intergalactic bandit, which does help explain how he was one of only two Asians on Eternia. Heck, since he’s a “master of several forms of martial arts,” he could be a refugee from Earth for all we know. The bio notes that Fisto is his archenemy, backing up my ad-hoc counterpart theory. As for Jitsu getting to rule Snake Mountain with a golden fist after Skeletor heads to the final frontier, I’m not sure whether that means Skeletor trusts Jitsu implicitly or finds him so incompetent he just left him behind. As one of the earliest and most iconic characters, Jitsu gets a lot of love from Mattel and the Four Horsemen. Since most of him can be re-used from other figures, his only new parts are his armor, fist and head, but they’re all well-designed and sculpted. He also has the extra-thick right bicep from Fisto; otherwise, the rest of him is the same MOTUC body we’ve been seeing from the beginning of the line (except for the improved ankles). The vintage figure’s hand was large and fairly simple in design, but was vac-metallized; the Millennium Staction’s hand was gigantic and as detailed as Mandarin Spawn. 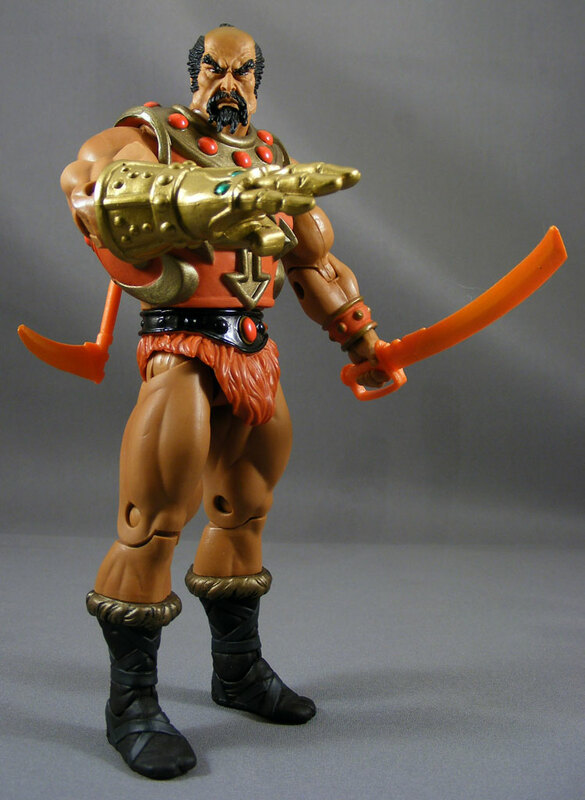 The MOTUC version splits the difference with more detail but no chrome. The head is very intricately sculpted, with detailing right down to the furrow of his brow and the crow’s feet around his eyes. 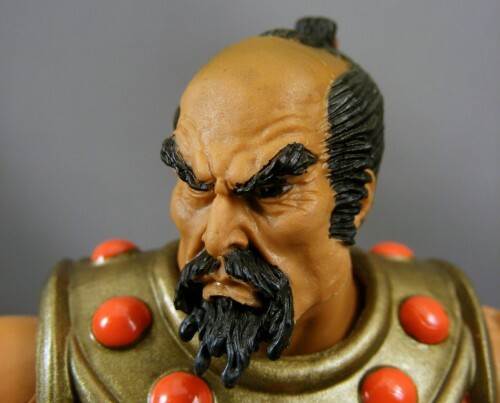 I feel obliged to point out that, relative to most other heads sculpts in MOTUC, one could argue this head was too detailed. It’s almost good enough for the Staction. It’s a little bit incongruous compared to the rest of his body, but I’ll admit it’s not the sort of thing that tends to bother me all that much. But I know some collectors really do care about the conformity of look among a single toyline, so I wanted to point it out. To those of you who would never have noticed and will now be bugged by it, I apologize. The paint work on MOTUC figures often varies by figure, but Jitsu appears to be one of the better examples. The detail work on his head, torso, and oversize hand is well executed, with little bleed. If any aspect of Jitsu disappoints, it’s his weapons. He comes with a curved sword (not sure whether to call it a katana, sabre, or who knows what else – perhaps Misterbigbo can enlighten us in the comments) and two kama. They’re cast in screaming bright orange plastic, though the blades have a metallic orange paint job. It’s evocative of the vintage figure (and they corrected the memorably reversed hand guard), but man, they’re just so painfully bright. This is something the line has done since the beginning – Tri-Klops had his green sword, Spikor his orange mace, Fisto his purple sword – but frankly it’s an aspect of the line I’ve always thought I could do without. I’ll take the corrected Tri-Klops sword from the first Weapons Pack over the green one any day. Still, it’s nice to get three weapons. They’re designed well, and the kama can be stored on his back. 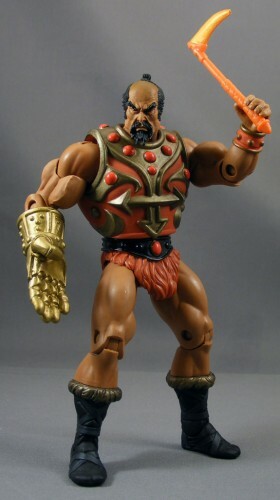 He features the usual MOTUC articulation. I found the joints on mine were particularly tight, which I’ll always welcome over loose joints. 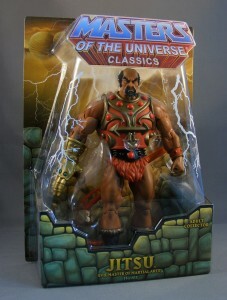 Jitsu is another great addition to MOTUC. Aside from the weapons, he’s exactly what I would have wanted from his MOTUC figure. I can see someone being bothered by his more-detailed-than-normal head, but from a foot or two away it’s hardly noticeable. Overall, another great figure from Mattel and the Four Horsemen. Please check out these other MOTU Day reviews at other websites! I need to stop reading reviews of the figures I missed. My bank account curses you. I sort of put him aside shortly after I got him, but now I want to pull him back off the shelf and mess around with him. I do really like the very detailed face, it goes well with Fisto who also has the same "problem." I thought I heard the same guy sculpted those two, I really like his work. Whoever he may be, the mysterious 5th Horseman I guess. Catholic Tradition made them into:"
So I guess Pestilence is the fifth! 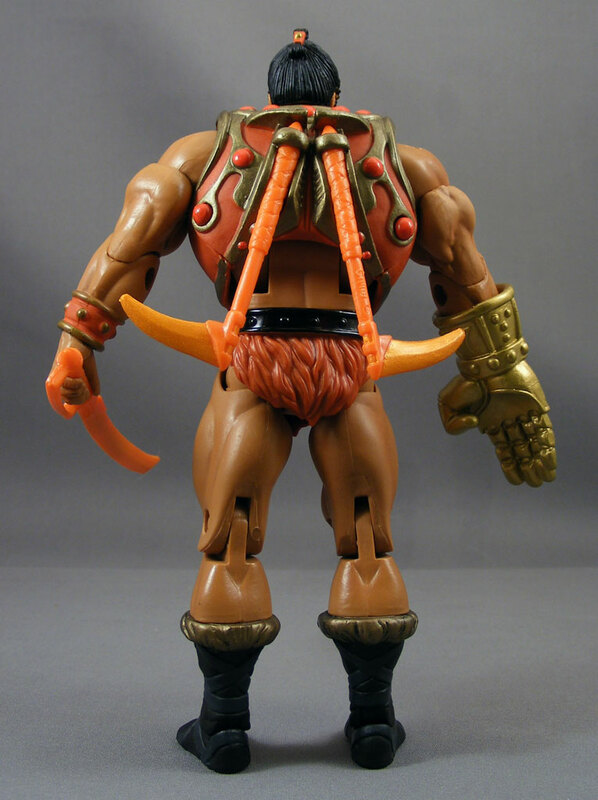 Pingback We Need a Masters of the Universe Classics Roton Toy, Right? I had forgotten that the sword handle was backwards on the vintage figure. Definitely glad they fixed that but I'm surprised I've never heard of anyone outraged that Mattel made the change. Incidentally, he can theoretically store his sword on his back, too. There's a notch between the kama that I believe is intended to hold the sword. It's pretty tenuous, but I'm reasonably sure it's intentional.